Women in Iran have been posting photos on social media of themselves riding bicycles, defying a fatwa forbidding them from cycling in public. It had been understood women that could cycle as long as religious concerns were respected. But when asked recently, Iran's Supreme Leader, Ali Khamenei, said women were not allowed to cycle in public or in the presence of strangers. The issue came into focus earlier this year, when campaigners in Iran began marking "car-free Tuesdays" to encourage people to leave their cars at home in the hope of cutting down on pollution. When women were seen taking part in campaign bike rides, it was frowned upon by some Iranian clerics. Now, Iranian women have been using social media to highlight the subject, adding the hashtag #IranianWomenLoveCycling. A video a mother and daughter filmed of themselves cycling in Iran has had 98,000 views since it was posted on My Stealthy Freedom's Facebook page on Monday. Campaign founder Masih Alinejad, who is based in New York, said: "They told me that they are not going to give up because they think biking is their absolute right. "It is absolutely shameful to hear such a backward fatwa against women in the 21st Century. "It is unacceptable in 2016 when you hear that a group of female cyclists have been arrested in Iran for the crime of riding a bike in a public place and made to sign a pledge promising they will not cycle in public again. "I called on women through my Instagram account to share their reaction, and I received so many photos and videos of women cycling." "I've received messages from inside Iran from women who are shocked and want to protest." 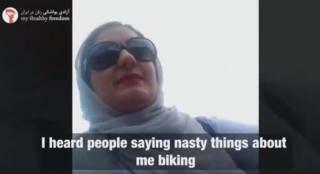 In another video, a female cyclist is seen saying some men had said some "nasty things" about her as she had ridden past them. Ms Alinejad said: "The activity does not have a defined penalty in Iran's legal code, but modesty laws are used against women who cycle in public. "Women in Iran want to be active in society - but, for the clerics, that's a big threat because, in their eyes women, should not be seen or heard but stuck in the kitchen. "It is our basic right to be able to freely cycle. "I strongly believe that these acts will bring change. "Women are the main agents of change, and as they push for equality, we see greater push back from the Islamic Republic [of Iran]. "The fight for equality is a historical process, and just in the same way that women succeeded in Europe and the US to win their rights, so will women in Iran."